Heat oven to 350°F. Line 8- or 9-inch square pan with foil, leaving 1 inch of foil overhanging at 2 opposite sides of pan; spray foil with cooking spray. Make and bake brownies as directed on box, using water, oil and egg. Cool completely in pan on cooling rack, about 1 hour. Freeze uncut brownies 30 minutes. Use foil to lift out of pan. Cut into 5 rows by 3 rows. Roll each brownie into a ball. Roll balls in chocolate sprinkles, pressing to adhere. In small microwavable bowl, microwave candy coating on Medium (50%) 30 seconds, then in 15-second increments until melted; stir until smooth. 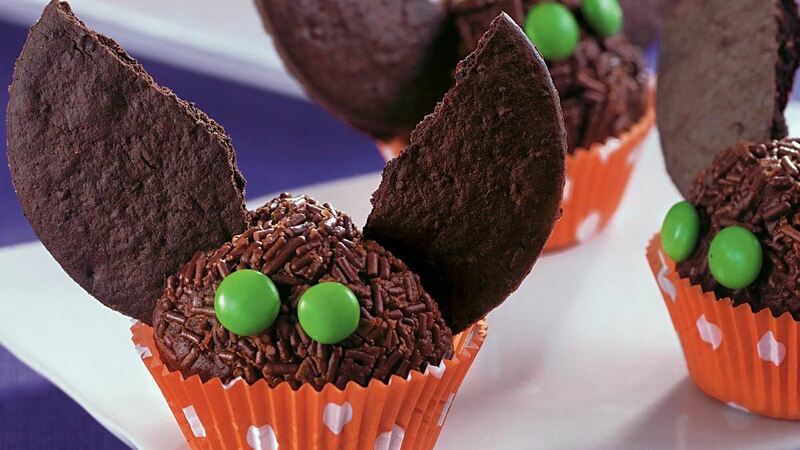 Dip tips of broken wafer cookies in melted candy; insert into truffles to look like wings. Use remaining melted candy to attach 2 chocolate candies to each truffle for eyes. Serving Tip: Place each brownie truffle in a small decorative paper liner for serving.